Just a few years ago, on-demand companies like Uber, Luxe, Shyp, Instacart and others seemed to be popping up everywhere. Now, the on-demand economy has grown to attract 22.4 million consumers annually and generates $57.6 billion in consumer spending. Make no mistake, the on-demand economy is booming, and both investors and sales teams are taking note. That’s why we’re excited about our latest Mattermark product enhancements focus on making the discovery of emerging on-demand companies way more efficient. If you’re in finance, that means you’ll be able to surface and evaluate more investment opportunities in the on-demand space, and leverage the Mattermark Growth and Mindshare scores to zero in on those with the most potential for your portfolio. With enhanced search functionality that surfaces more companies in this fast-growing space, sales teams benefit, too. With Mattermark, you can build prospecting lists that include more on-demand companies with a strong growth trajectory. 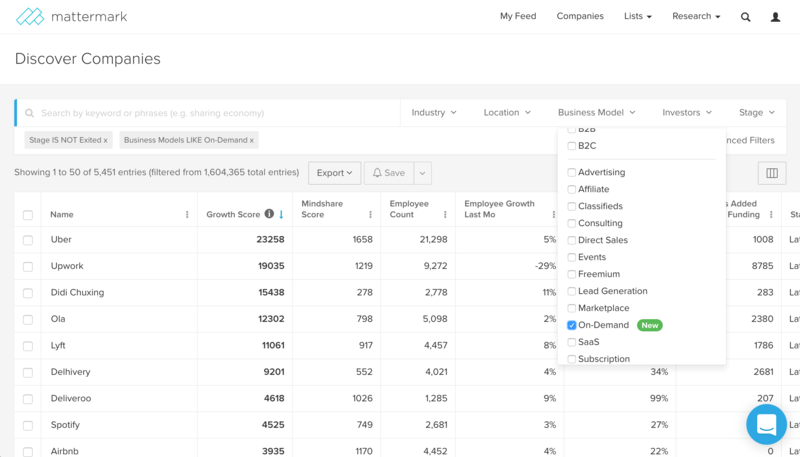 Further divide (and conquer) your prospecting by ranking companies with a Mattermark Growth Score within your list, then go after the ones with most momentum. With these latest enhancements to Mattermark, it’s easy to find the right companies to reach out to at exactly the right time. See On-Demand Companies in Mattermark Now! Don’t have a Mattermark account?